Please join families from around Santa Cruz County as they come together to hear from Sharon Papo, new executive director of the Diversity Center, and Patti Weiss, Sharon’s mother-in-law. 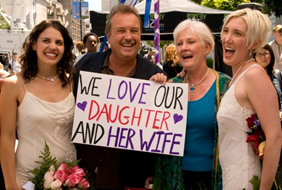 Sharon will share her experiences of being a love activist (which led her to get married 8 times to her beloved, Amber Weiss). Sharon will also share how being married has affected her as a spouse, parent and family member. Sharon’s mother-in-law Patti Weiss, will speak about her experience of being a parent. Discussion to follow. All welcome! The first hour of the PFLAG Santa Cruz County (Parents, Families and Friends of Lesbians & Gays) meeting is dedicated to discussion groups followed by a brief break. The second hour is dedicated to our April program. Sharon Papo is a Bay Area native who has been a community activist for over fifteen years. Before joining the Diversity Center, Sharon was the Executive Director of 3rd Street Youth Center and Clinic, a multi-service health center in Bayview Hunters Point, San Francisco. Sharon has also coordinated the Santa Cruz-based LGBT youth program “STRANGE” and worked as a counselor serving marginally housed youth. Additionally she was a health educator for foster care, homeless and incarcerated youth and served as the Program Director of Puente: Building Between Jews and Latinos. Sharon holds a BA from UC Santa Cruz in Feminist Studies and a Masters in Social Welfare from UC Berkeley with a concentration in management and planning Sharon lives in Santa Cruz, with her wife, Amber Weiss, and their son Skyler. Patti Weiss is a Soquel resident who is a retired neo-natal nurse. Patti is a proud wife, mother, mother-in-law and grandmother. Patti is a talented jeweler and her company is called SHMLEY (See How Much I Love You) Creations. Patti donates all of her jewelry. Patti enjoys cooking amazing feasts, gardening, and putting Martha Stewart to shame with festive holiday decorating. The Diversity Center is dedicated to enhancing lives and promoting fairness for Lesbian, Gay, Bisexual, Transgender and Queer (LGBTQ) people in Santa Cruz County. Our vision is a healthy, vibrant, and diverse LGBTQ community in Santa Cruz County that is free from fear, hatred, and prejudice. The Diversity Center is the only LGBTQ Community Center on the Central Coast of California. The Diversity Center produces the 3rd oldest Pride celebration in California and the largest free gathering on the Central Coast. The Diversity Center serves the larger community through events and has specific programming for teens, seniors and the transgender community. Additionally we have our Triangle Speakers program, which is an educational speaker’s bureau that works to eliminate the fear, prejudice and hatred of LGBTQ individuals and their allies. For more information about The Diversity Center, please visit www.diversitycenter.org or contact (831) 425-5422.